Alfa Romeo re-entered the U.S market in a stunning way. Dismissing the fun but irrelevant 4C for a moment, the Giulia hit the premium compact sport sedan market like a hand grenade, shattering both preconceived notions and expectations. Why would you have a BMW 3 Series when for the same money you could have the better-looking, better-driving, better-sounding, and an oh-so-fabulously Italian equivalent? Badge loyalty? Case(s) in point, the turbocharged four-cylinder Giulia sedan beat out eight competitors in one of our Big Tests, the geezed up, 505-horsepower Quadrifoglio version bested the relevant competition in a Head 2 Head (plus a sixth-place showing at last year’s Best Driver’s Car—out of 12—as the lone sedan), and it beat out all the other new cars to take home the industry’s most coveted award, our own Motor Trend Car of the Year. Alfa then followed up the Giulia with the Stelvio, one of the prettiest SUVs the world has ever seen. What did we think? Some of us really liked it. “It flows around curves like massage oil over bare flesh,” Scott Evans purred. A slightly less turned-on Angus MacKenzie said, “Refined, sporty, the Stelvio is a 21st century gran turismo that can take you along all roads in all weather, at speed and in comfort.” Additionally, thanks to some quirks and electrical bugs in an early-build Ti Sport, the Stelvio just missed being named our 2018 SUV of the Year. Based on all that, one might jump to the conclusion that the Stelvio Quadrifoglio, by virtue of ditching the 280-horsepower 2.0-liter turbocharged I-4 in favor of a 505-hp 2.9-liter twin-turbo V-6, ought to be one gobsmackingly great SUV, right? The engine certainly doesn’t hurt anything. In addition to the 505 Italian stallions, the Stelvio Q4 (as it’s badged) comes packing 443 lb-ft of torque, available from 2,500 to 5,000 rpm. The Quadrifoglio also sports a beefed-up version of the ZF eight-speed automatic transmission featuring an all-wheel-drive transfer case and massive column-mounted aluminum paddles. The computers—known as Chassis Domain Control in Alfaspeak—can vary the torque split as needed: 100 percent of the twisting force can be diverted to the rear wheels, as well as up to sixty percent of the torque to the fronts. There’s also a torque-vectoring rear axle, which can overdrive either outside rear tire by 50 percent. The steering ratio is shockingly direct: 12.0:1. To give you some context on just how direct, a Porsche 911 Carrera S’ steering ratio varies from 16.6:1 all the way down to 12.25:1 in Sport Plus. The Stelvio Q4’s 12.0:1 is the same as the C7 Corvette in its most aggressive setting. The brakes are big and strong and made by Brembo. The standard drilled steel brakes are 15.4 inches front, 13.8 rear. Should you opt for the $8,000 carbon-ceramic brakes, the rotors grow to 15.7 inches up front, 14.2 in the rear. No matter the disc material, all are squeezed by six-piston front and four-piston rear calipers. Why so much braking power? Because Alfa Romeo is claiming the sporty thing weighs 4,367 pounds. Not to cast aspersions, but I’ve never met an Italian car that was close to the manufacturer’s claimed poundage. Not once. This rig might be closer than others, though, as the four-cylinder Stelvio weighed in at 4,018 pounds. Looking at our test database, there’s about a 250-pound difference between the four- and six-cylinder Giulias, and all-wheel-drive hardware usually adds 150 pounds. That’s at least 400 pounds. Alfa is claiming that the Stelvio Q4 retains its 50/50 weight distribution. We shall see. Alfa Romeo is claiming that the Stelvio Q4 will hustle to 60 mph in a super-quick 3.6 seconds. 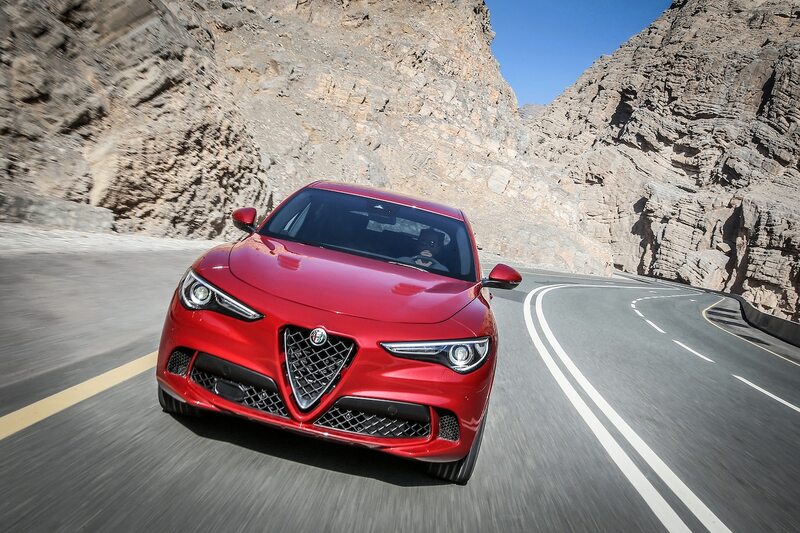 When it first announced the car Alfa had stated 3.9 seconds to 60 mph, but thanks to some software refiddling by chief engineer Andrea Zizak and his team, they managed to knock off 0.3 seconds If true, that’s quicker than a four-leaf Giulia by 0.2 second. Alfa also claimed that the Stelvio Q4 is as quick to 60 mph as a Porsche 911 GT3 manual. Only problem for Alfa is we just tested that particular Porsche, and our guys clutch-dropped the row-your-own GT3 to 60 mph in 3.5 seconds. So there you have it: Your mall-seeking, five-passenger, two-ton-plus crossover is 0.1 second off a road-going race car stoplight to stoplight. Also, the Stelvio Quadrifoglio set the SUV record on the Nürburgring’s Nordschleife: 7 minutes, 51.7 seconds. That’s 0.1 second quicker than a Lamborghini Gallardo LP560-4, a great all-wheel-drive supercar. What a golden age for the automobile. One thing: I imagine the 650-horsepower Lamborghini Urus will soon eat the Stelvio Q4’s ’Ring record for breakfast. Call it a hunch. Alfa Romeo turned us loose in a squadron of Stelvio Q4s on the mean, wet, traffic-snarled streets around Austin, Texas. If I ever hear a Texan say Californians can’t drive in the rain, I’ll laugh at their truck. Anyhow, during normal if not borderline miserable commuting situations, the 505-hp Alfa is quite good to drive with the lone notable exception of the brakes in stop-and-go traffic. For performance (and probably packaging) reasons, Alfa Romeo went with a brake-by-wire system. The car stops on a dime even when you’d like it to stop on two bits. That’s my not so clever way of saying that these brakes, just like on the Giulia, are grabby and frankly impossible to modulate. Hey, keeps you on your toes. Leaving the DNA Pro in N (for Natural), you’re treated to a firm but focused ride, a mild exhaust note, and that wonderful, ultra-direct steering response. Choosing A (Advanced efficiency) goes into some sort of eco mode with cylinder deactivation, but I honestly didn’t bother trying it. For a more boring review, look elsewhere! Rotating the dial to D (for Dynamic) cranks up the SUV’s reflexes nicely, sharpening the throttle response, moving shift points higher, and most perceptibly firming up the three-way adjustable shocks. The ride in D is now flinty, the word I use to describe the way I like sports cars (and apparently sport SUVs) to feel. There’s a button in the center of the rotary knob that allows you to change the three-way dampers’ firmness, though it is mode-dependent. For instance, if you’re in D mode, the dampers default to medium firmness, and if you click the button, you go down to soft. Hard is only available in Race. As bad and dull as the driving around Travis County was, the reason Alfa schlepped all us journo types down to Austin is that first-rate F1 track located well outside the city limits, Circuit of the Americas, aka COTA. The modern 3.4-mile track has 20 turns and what feels like two braking zones. Good times. 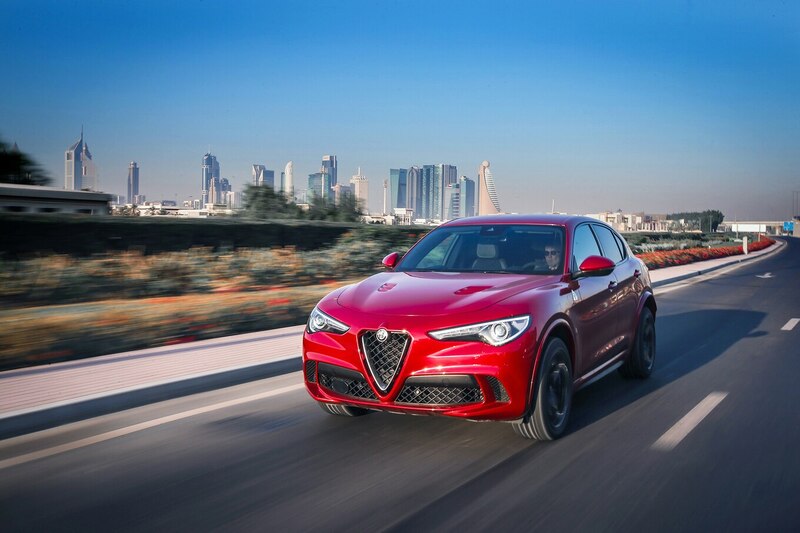 Switching the Stelvio Quadrifoglio into Race—by turning the knob past D and holding it for a beat—does many things. For one, the dampers are now in their most rigid setting. Should you want to click down to medium, feel free, but you’re locked out of soft. So be it. Most important, Race turns both traction and stability controls all the way off. True, there’s still an anti-rollover line of code running, but you have to do something extremely wrong to have that kick in on a track. Weirdly, there’s no other way to turn everything off. COTA was still soaking wet from the morning’s rains, and around Turn 12 I realized that the 255/45R20 front, 285/40R20 rear Pirelli P Zero summer tires weren’t the fast way around the track, especially with all the nannies disabled. Catching drifts—although fun—is quite slow. I swallowed my pride, clicked back into D, and tried to hustle. The Stelvio was still limited by summer tires, only now in D the computer was constantly applying brakes and cutting power. Not so fast with the added insult of being not so fun. The only part of the track the Stelvio could tackle at speed was the relatively mild downhill Turn 10. The little beast wanted to run and play, but the inclement weather meant it was wearing the wrong shoes. Hey, we tried. Time for lunch. As we snacked on risotto, something miraculous happened. The sun came out and dried off the track. Time to see what the Stelvio Quadrifoglio could actually do. Yes, as you’re imaging, the SUV’s power is great, allowing me to see triple digits on both the front and big back straight, and maybe once or twice on the run up to 11. My big wish, however, would be for another 1,000 rpm from the 2.9-liter. The 6,500-rpm redline gets achieved so quickly that if you’re in manual mode and not looking at the tach/handy yellow shift lights, you will bog the engine into the rev limiter. Because you ought to have your eyes up when playing on a racetrack, this issue plagued me throughout the day. Likewise, the Giulia Q suffers from the same problem. But because the Stelvio Q4 is in fact quicker, you bog more frequently. Especially trying to go from second to third. Anyhow, you learn to work around the issue. Grip is impressive, especially once you’re post-apex and on the power. The torque-vectoring rear end allows the car to yaw out a few degrees. For the first few corners you might misinterpret this as oversteer/lack of rear-end bite, but you soon realize the Stelvio is happy to rotate around corners in a predictable, repeatable way. I’ve never found or heard anyone complain that the Giulia Quadrifoglio understeers. Sadly, adding 600 or more pounds to the (brilliant) Giorgio platform results in exactly that. However, if you drive the Stelvio Q4 like an AWD car should most properly be driven (aka get your braking done while pointed straight then trail the left pedal into the corner), you can alleviate the thing’s propensity to understeer, get back on the power early, and use the grip and torque to simply blast off the apex. Not that you ever would, but if you do plan on doing 15 laps on a modern F1 course, you must spring for the optional carbon-ceramic brakes. They do not fade and work brilliantly. If you’re going for the total track-rat experience, you’ll also want to forget the panoramic sunroof and spring for the carbon-fiber-backed racing buckets. I’ve been fortunate (I think that’s the word) enough to drive a large number of powerful SUVs on racetracks. Most start out OK for one or two laps but then quickly succumb to brake fade, heat soak, tire decimation, and a whole raft of other reasons proving why big, heavy objects do not belong on track. Not the case with the Stelvio Quadrifoglio. I believe the highest praise I can give to the thing is that the laps stayed consistent to the point that I was able to forget about the SUV and simply concentrate on improving my lines. 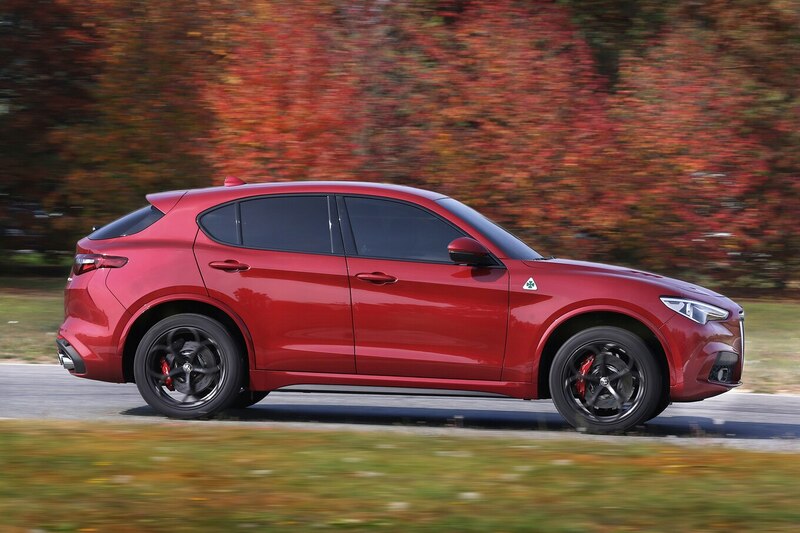 As hard as that is to believe, this Alfa is a track … SUV. A few of us looked at tires that had been on the vehicles for 20 or more laps, and they were just beginning to show signs of abuse. Quite impressive. Now comes the part Alfa Romeo will hate. See, although the Stelvio Quadrifoglio does work as a track toy, it’s compromised in terms of performance by weight and center of gravity. Always will be. You know what would make an even better, quicker, and more satisfying track car with the same utility as the Stelvio Q4? That’s right: a Giulia Q wagon. Think about it. How much more would a wagon weigh than the standard four-door? One hundred fifty pounds? Two hundred? Certainly nowhere near 600 pounds. And the wagon Giulia would, could remain rear-wheel drive. As effective as the Stelvio Q4’s torque-shuttling AWD system is, a rear-driver drives better. Especially if my pie-in-the-sky wagon could come equipped—like the Giulia Q—with a stiff carbon-fiber long roof. Dare to dream. I know, I know, the world has gone SUV crazy, and nobody buys wagons. But like, man, that ain’t my fault. 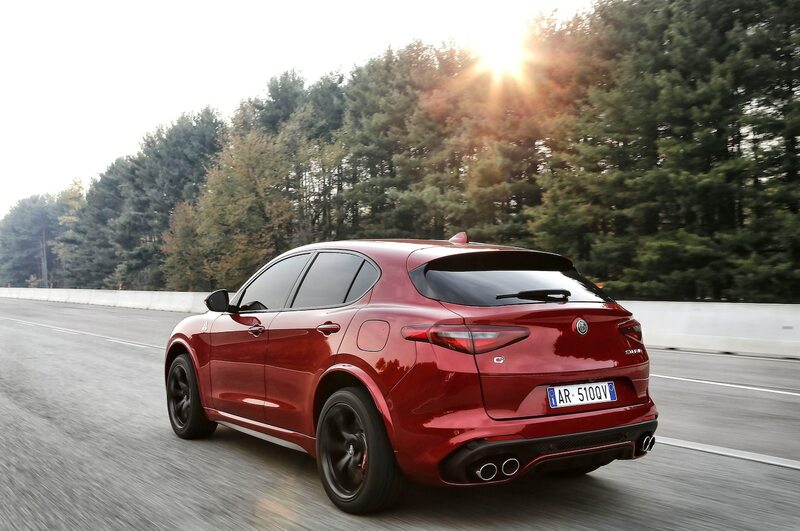 To summarize: Alfa Romeo pulled off the seemingly impossible, making an SUV that’s a blast to drive, lap after lap. No easy feat. Competition? The Porsche Macan Turbo is down on power (“only” 440 hp) and is based on FWD architecture, making it not only slower but also less fun to drive. I haven’t driven the Mercedes-AMG GLC63 S Coupe, but I’m thinking it will not only make for a fun comparison test but that there is also no way the AMG will have the Alfa’s on-track stamina. Another hunch. Also, the Alfa Romeo costs less ($81,590 base) than either German. To close this review out, it’s nice to see that the Giulia Quadrifoglio wasn’t a fluke. Alfa Romeo is not only back, but it’s also out for blood.